1 Ibis are wading birds. They have long legs and long toes. They like to walk, fly, or just sit in trees. Ibis live on all the continents in the world except Antarctica. They live in wetlands, forests, savannas, and coastal areas. 2 An ibis has a long, thin bill. It uses its bill to search for food in water, mud, or in cracks in dry ground. Ibis like to eat beetles, worms, fish, crustaceans, and even rotting meat. The ibis uses feelers in its bill to tell what food is without seeing the food. The ibis has nostrils at the base of its bill. 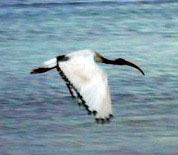 The ibis is able to breathe even when it sticks its bill into mud or water. The ibis also uses its bill for preening its feathers. Preening means the ibis is cleaning and smoothing its feathers. 3 The scarlet ibis is the most colorful ibis. Its body is completely scarlet except for the black tips on its wings. Even its legs and feet are scarlet. The red color comes from pigments in the crustaceans that the scarlet ibis eats. The scarlet ibis lives in South America. It is the national bird of Trinidad and Tobago.